Duart Castle is a wonderful place to get married, standing proudly on a cliff top guarding the Sound of Mull, Duart enjoys one of the most spectacular positions on the west coast of Scotland. For over 600 years the Castle has been the seat of the Clan Maclean, and is steeped in history over the centuries. Today it is home to Sir Lachlan Maclean, Bt. 28th Chief of the Clan Maclean, and to the Clansmen of the Clan Maclean and its extended family. 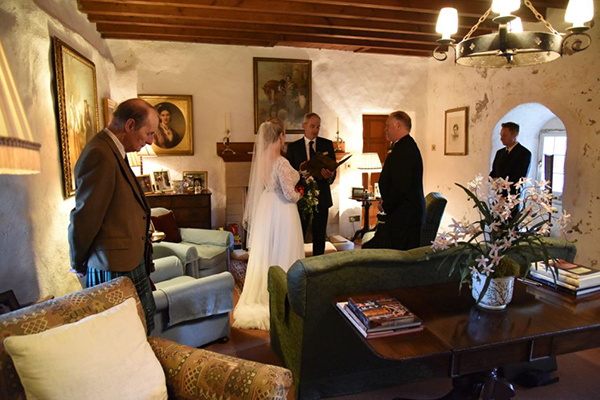 Sir Lachlan is always delighted to welcome members of the Clan to Duart who choose to have their wedding, or to renew their wedding vows at the Castle. It then makes it an even more special location and a truly wonderful place for your very special day. We have three places where you can have your wedding ceremony at Duart: outside by the single cannon looking down the Sound of Mull, in the Banqueting Hall, or in the Sea Room in the Castle. The Drawing Room is also occasionally available. Please email us at weddings@duartcastle.com or fill out the form below for more information about wedding packages and rates. 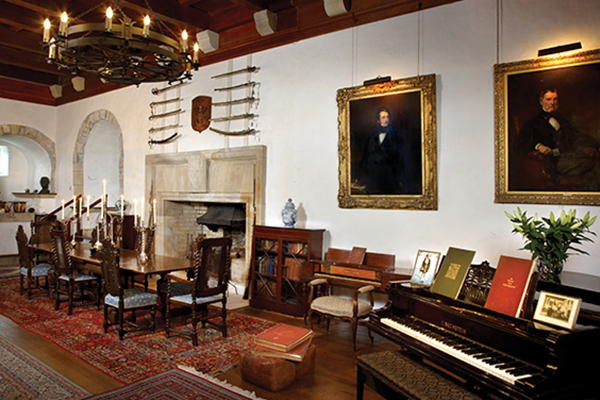 The Banqueting Hall or Great Hall is the largest room in the Castle, accessed by the Sea Room. As you enter, hanging over the door are the silk regimental colours of the 236th Battalion, Canadian Expeditionary Force, the Maclean Kilties of America. 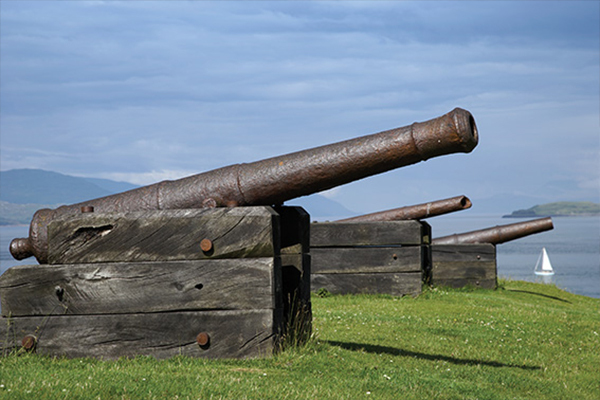 These are in safe keeping as long as the Chief occupies Duart Castle. Moving round the hall, the walls are adorned by portraits of three centuries of Macleans, the coat of arms of the 26th Chief hangs over the fireplace and there is an abundance of historical artefacts. This room lends itself well to larger weddings, and can be set up with seating according to the number of guests attending, to a max of 80, with the remaining guests being required to stand. There is a grand piano in the Banqueting Hall. If you have a friend or a member of your family who would like to play, we would be delighted for the piano to be used. The Sea Room is the access room to the Great Hall. 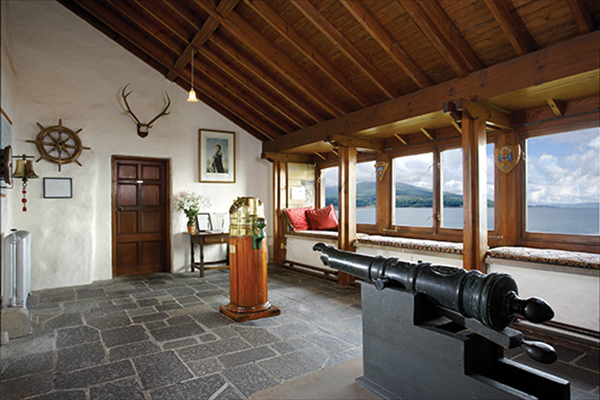 Large windows accommodate the south facing aspect of this room giving the most magnificent views from within the Castle looking down the Sound of Mull and Loch Linnhe. There is a small Spanish cannon within the room that came from Tobermory Bay where the galleon from the Armada sank and the bell, wheel and binnacle are from the RMS Lochinvar which was the first motor vessel to serve the island. This room is also licensed for weddings and suits smaller wedding parties up to a maximum of 20 people. As it is the entrance room to the Banqueting Hall, the use of the Sea Room is included in the price for the Banqueting Hall. This room is the Chief’s private Drawing Room which is not open to the public and is occasionally available. It is a beautiful room, tastefully decorated located off the Banqueting Hall. It is a much smaller, and a more intimate room lending itself to smaller wedding parties to a maximum of 20 people. The outdoor wedding venue is by the single cannon, facing up the Sound of Mull. This is truly an amazing location. The Registrar will require you to make a provisional booking for an indoor venue in case of bad weather.